Like many who suffer from ectodermal dysplasia (ED), 14-month-old Jacob was initially diagnosed by his dentist. As the first health care provider to link together the various symptoms described by the child’s parents—delayed teething, severe facial eczema, sparse eyelashes and missing eyebrows, red rimmed eyes, unwillingness to drink warm beverages—Jacob’s dentist suspected an ED disorder. “One of the challenges in diagnosing ED is that is it not always a simple, consistent, predictable clinical presentation,” explains Dr. Kevin Butterfield, division chief of dentistry and oral and maxillofacial surgery at the Ottawa Hospital. When Jacob was first diagnosed, there was no Canadian organization dedicated to helping patients with ED. To help fill that gap in service, Meghan Howard founded the Canadian Ectodermal Dysplasia Syndromes Association (CEDSA) in 2010. CEDSA supports families through teleseminars with maxillofacial surgeons, a comprehensive website, regular newsletters, a support fund to help cover the important dental and medical costs associated with treatment, and the creation of a secure medical and dental expert database. To learn more about CEDSA activities and services, visit www.ectodermaldysplasia.ca. When Jacob’s dentist believed that the toddler likely had ED, he referred him to a pediatric dentist who practises at the Children’s Hospital of Eastern Ontario (CHEO). “We were so relieved and grateful to meet with a specialist experienced in treating patients with ED,” remembers Ms. Howard. Patients with ED are usually good candidates for implant therapy, and the procedure success rate compares to that of normal patients. However, they often have to undergo bone augmentation in preparation for implant placement. 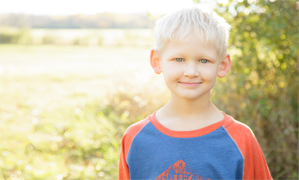 In October 2013, Dr. Butterfield performed dental implant placement on Jacob, who is now 5 years old. “While the varying clinical presentations can cause difficulties in the diagnostic process, the prosthetic management has dramatically improved as we are now able to provide patients with a predictable functional result,” says Dr. Butterfield. Prognosis for people with ED is generally very good. They have a normal life expectancy, and most disorders do not lead to developmental delays. Jacob’s resilience to his condition never ceases to impress his mother. “He absolutely refuses to let ED slow him down. He could teach many of us what courage really means,” says Ms. Howard. Canada Ectodermal Dysplasia Syndromes Association website [accessed 2013 Oct 21]. Available: www.ectodermaldysplasia.ca. Jones J, Holland M et al. Ectodermal dysplasia [accessed 2013 Oct 21]. Available: radiopaedia.org/articles/ectodermal-dysplasia. Van Sickels JE, Raybould TP, Hicks EP. Interdisciplinary management of patients with ectodermal dysplasia. J Oral Implantol. 2010;36(3):239-45. Li D, Lui Y, Ma W, Song Y. Review of ectodermal dysplasia: case report on treatment planning and surgical management of oligodontia with implant restorations. Implant Dent. 2011 Oct;20(5):328-30.